Jarman was born in Nashville, Tennessee. As a child, he acted in productions of the Nashville Community Playhouse's Children's Theater. 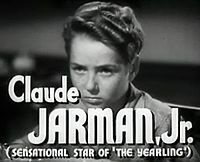 Jarman was 10 years old and in the fifth grade in Nashville when he was discovered in a nationwide talent search by MGM Studios, and was cast as the lead actor in the film The Yearling (1946). 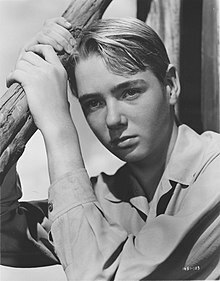 His performance received glowing reviews and he received a special Academy Award as outstanding child actor of 1946 as a result. He continued his studies at the MGM studio school, and made a total of 11 films. By the time he reached his early twenties he chose to leave his film career behind. Republic Studios cast him in a couple of B-movies, but discouraged, he moved back to Tennessee to finish college at Vanderbilt University. Following coursework in pre-law at Vanderbilt, Jarman appeared in Disney's The Great Locomotive Chase (1956), which was his final movie. After that, he served three years in the U.S. Navy, doing public relations work. Jarman moved to working behind the scenes. He ran the San Francisco Film Festival for 15 years (1965–1980) and was known for his in-depth retrospectives of movie stars and directors. He was Executive Producer of the music documentary film Fillmore (1972), about rock impresario Bill Graham. He returned to acting with a role on an episode of the television production Centennial (1978). Jarman was a special guest as a past acting award winner at both the 1998 and 2003 Academy Awards Ceremonies.He served as Director of Cultural Affairs for the City of San Francisco. He founded Jarman Travel Inc. in 1986 to serve the travel needs of corporations and executives. Jarman has seven children by three wives, including two daughters with his current wife, Katharine. In 2018, he wrote a book about his life titled My Life and the Final Days of Hollywood. ^ a b "classicmoviekids.com". Classicmoviekids.com. Retrieved 2016-10-26. ^ "Local Boy, 10, Signs Contract For Hollywood Screen Test". The Tennessean. Tennessee, Nashville. February 27, 1945. p. 3. Retrieved June 24, 2018 – via Newspapers.com. ^ "Child actor in new career". Times Daily. February 28, 1960. Retrieved May 3, 2014. ^ "("Jarman" search results)". Academy Awards Database. Academy of Motion Picture Arts and Sciences. Retrieved 25 June 2018. ^ a b c "Pals Of The Saddle – Claude Jarman Jr". DukeWayne.com. February 2, 2011. Archived from the original on 2016-03-04. Retrieved 2018-09-02. ^ "Flashback - Claude Jarman Jr". Beaver County Times. May 26, 1991. Retrieved May 3, 2014. Holmstrom, John (1996). The Moving Picture Boy: An International Encyclopaedia from 1Oo895 to 1995. Norwich: Michael Russell, p. 189-190. This page was last edited on 17 January 2019, at 15:07 (UTC).